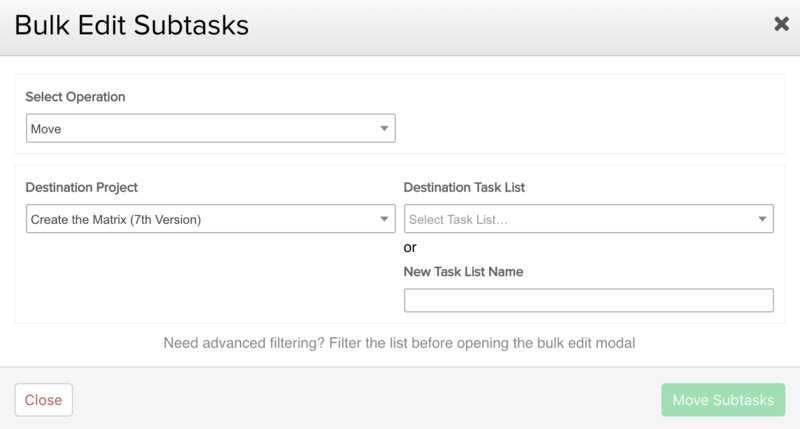 Within Teamwork Projects, you can use the bulk edit tasks feature to modify, complete, move, copy, or delete multiple subtasks in a task at once. 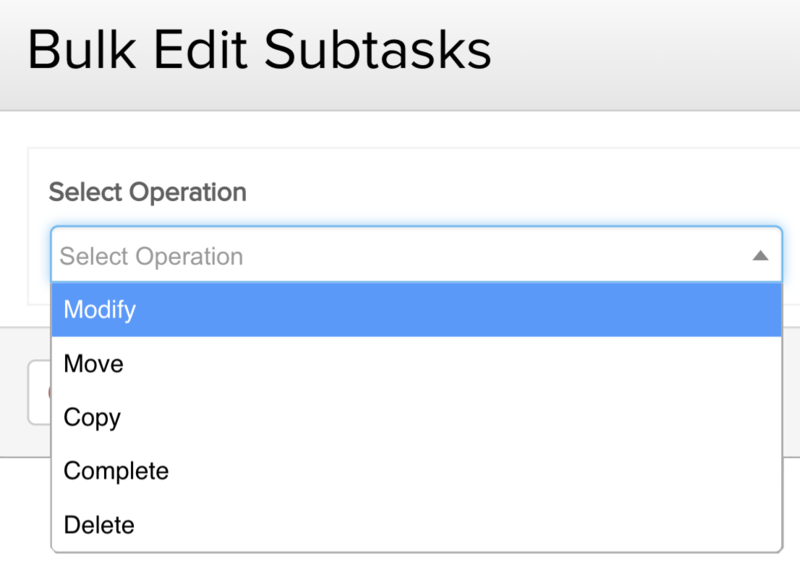 In the Tasks area of your project, under the parent task options menu choose the Bulk Edit Subtasks option. When you select the modify option, you will see the different task properties you can update. Selecting the checkbox next to each property will show a 'Select' link for you to choose the new setting for that option. 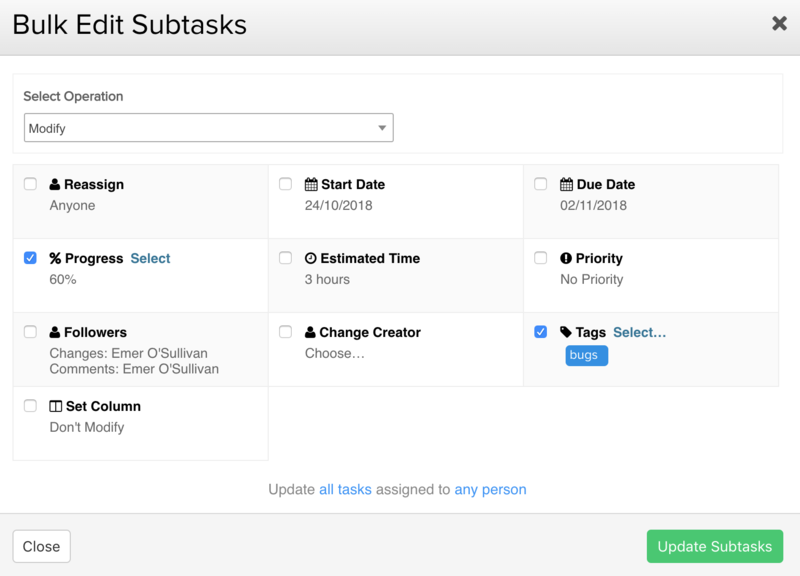 At the bottom of the screen, you can choose to apply the new settings to all of the tasks on the list, or just those with particular start and due dates (for example 'late tasks' or 'tasks due today'), or currently assigned to a particular person (this includes tasks assigned to that person along with others). 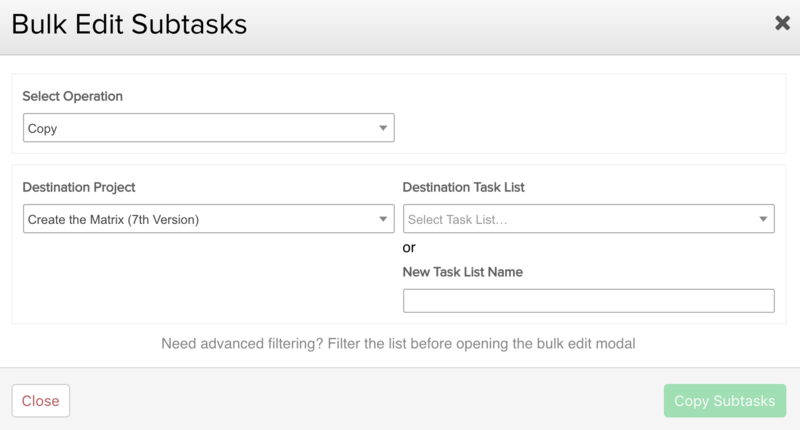 Note: The bulk modify subtasks feature only applies to the first level of subtasks. When choosing the move option, you can select a destination project and task list. If you don't want to use an existing task list, you can create a new list from within the modal. As with moving subtasks, the copy option allows you to select a destination project and task list. You can also create a new list from within the modal as your destination list. When you choose 'Complete' from the operation dropdown, you can then click the Complete Subtasks button in the modal. Similarly to the complete action, when you choose to delete, you need to click the Delete Subtasks button in the bottom right of the modal.